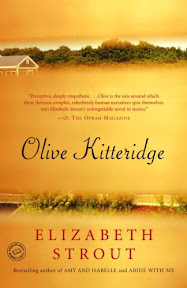 Olive Kitteridge [Book Review] – my books. my life. I’ve struggled writing this review (just as I struggled writing the summary). The book is very good, but I am not sure I can adequately explain why. When this happens, I kind of want to just tell you to go read it but that wouldn’t make me a very good book blogger so I am giving this a shot. This collection is an honest and heartbreaking look at life. It is beautifully-written but even more beautifully-developed. The characters, Olive and the rest of the town, and the keen insight into human interactions are what make this so good. Its Pulitzer is well-deserved. Olive is woven in and out of the stories; sometimes she has the lead and sometimes she just makes a quick appearance. While the town is the obvious connection between all of the stories, naming the book Olive Kitteridge, a subtler move, makes the reader dig a little deeper. The stories are sometimes sad, in the way that people stuck in a small town are so often portrayed as sad. People seem trapped by the lives they’ve made for themselves, but when we finally leave Crosby, we see more of the same. If you haven’t already, I recommend picking up Olive Kitteridge. I don’t think you’ll be disappointed. Aarrrgh! I have had this book on my shelf for the longest time, and have not gotten the chance to read it yet! Every time I hear how brilliant it is, I get mad at myself for repeatedly putting it off. Your review was so wonderful and thoughtful that I am kicking myself again. I am just going to have to try a little harder to get to this one! Fantastic review! I have this one on my tbr list. I hope to get to it soon. I agree. Sometimes a book is good and you just can’t name why. It’s happened to me before. I read Olive Kitteridge and thought it was wonderful, but didn’t review it, for many of the reasons you’ve articulated. Thanks for doing such a great job at it – and spreading the word of how well-deserved its accolades are. This books sounds absolutely fabulous. I have heard nothing but the best about it. I read this earlier in the year and I enjoyed it as well. I found some of it heartbreaking but most of all I found it to be pretty much like real life. Olive Kitteridge was one of my favorite books a couple years ago, yet so hard to write about… I think you’ve done a great job! Pingback: The Burgess Boys [Book Review] | my books. my life.